Now in its third year, the Innovate Finance Global Summit has become one of the most important global FinTech events to attend in London. This year, the conference gained a second day, dedicated to partner and sponsor breakout sessions, office hours and its brand new startup event, Pitch 360. 24 Startups under 8 categories presented their products and services to the main stage audience in a 6 minute pitch format. Meanwhile, the first day, was primarily busy with keynotes, panel discussions, fireside chats, roundtables and workshops around the hottest topics in FinTech, such as RegTech, Digital Identity, Blockchain, InsurTech. They also discussed the latest policy and regulation news and whether London will remain as the best city in the world for FinTech after the Brexit negotiations. Sessions across the Great Hall and Livery Hall were hosted by a list of well known and experienced FinTech professionals such as Dave Birch, Director of Consult Hyperion, Ruth Wandhofer, Global Head of Regulatory at Citi, Mike Blalock, General Manager of Intel FSI, Poppy Gustafsson, EMEA CEO of Darktrace, Paul Taylor, CEO of Thought Machine, and Kosta Peric, Deputy Director, Financial Services for the Poor of the Bill & Melinda Gates Foundation. The most popular topic mentioned in tweets and blogs by the top Innovate Finance Global Summit influencers is Brexit with a 21% share of voice, illustrating how most of the influencers think Brexit will largely impact the FinTech industry. Regulation and Policy comes second with 16% of all Tweet and Blog posts, reflecting how the Financial Services Industry spends annually millions in Regulatory Compliance and other Policy tasks and how the sector is putting efforts to invest in bringing down the costs by automating it with the goal to to know better their customers. Artificial Intelligence and Fintech is third, mainly thanks to the innovation effort the whole industry is making to “transform banks’ finance function within the next decade – if not sooner“. 2017 has unveiled RegTech, the fifth topic in our list, as one of the main trends, as many predict the beginning of fundamental, tech-enabled transformation of the middle and back office. Blockchain was the sixth largest conversation driver during the IFGS2017 due to the large efforts big banking corporations are putting into developing a blockchain based solutions to change the way International Finance is made. Pitch360 is the main event for the second day of IFGS2017, in which many innovative Startups, the sixth topic in our chart, had the chance to pitch their projects under eight categories in a six minute format. FinTech and London is the seventh most discussed topic during the event because after Britain voted to exit the European Union, with many experts and corporations discussing the possibility of London continuing as the best city for FinTech in the world or, on the other side, its throne being overtaken by other European or Asian city, like Hong Kong, Singapore or Berlin. FinTech Hubs is another hot topic, and gains the eight most vocal category because of its importance as key organisations for the growth and the sector consolidation. The ninth most vocal theme, InsurTech, is another FinTech success story for 2017 along with RegTech. The general Media and some influencers announce how “insurers are going to spend $185B on technology in 2017” with the objective of automating and digitalising the industry. 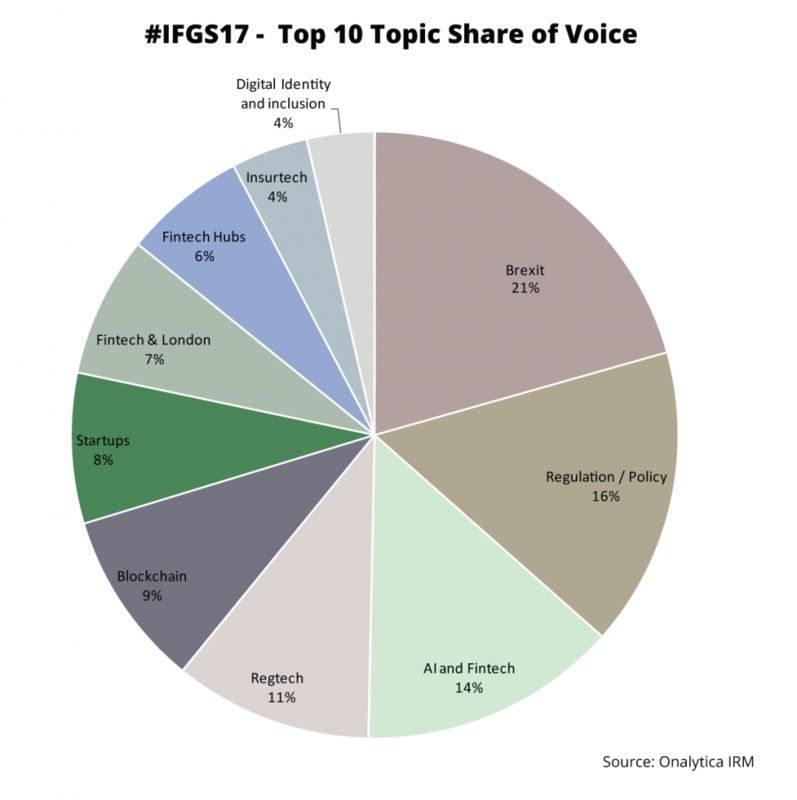 The tenth most vocal topic was Digital Identity and Inclusion, one of the topics most discussed during IFGS2017, because, on the first day, a Keynote Conference on this topic was hosted. We were very interested in seeing which brand and individuals were leading the discussion at #IFGS17, so we analysed over 390K tweets mentioning the key words: “Innovate Finance Global Summit 2017” OR #IFGS2017 OR #IFGS17 from 10th – 13th April 2017. We then identified the top 100 most influential brands and individuals leading the discussion on Twitter. What we discovered was a very engaged community, with much discussion between individuals and brands. 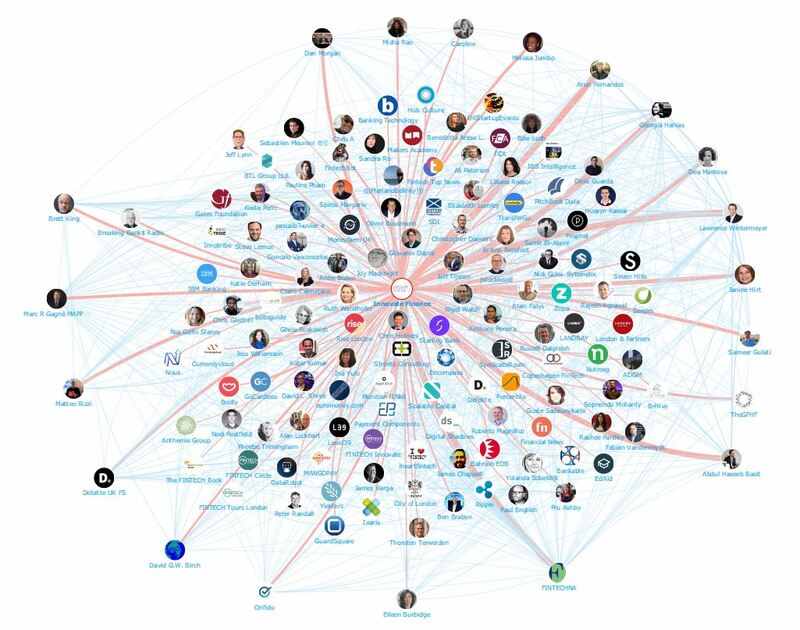 Below you can see a network map of the #IFGS17 conversation with the number 1 influencer Chris Gledhill at the centre. This map was created with our Influencer Relationship Management software (IRM). Be sure to click on the map to enjoy the full size network diagram in greater detail. Below you can see another network map created with our Influencer Relationship Management software (IRM) showing the number 1 brand Innovate Finance at the centre and all the #IFGS17 conversations to and from the influencers in their field. If you are interested in learning more about identifying, managing and engaging with influencers click here to get in touch! 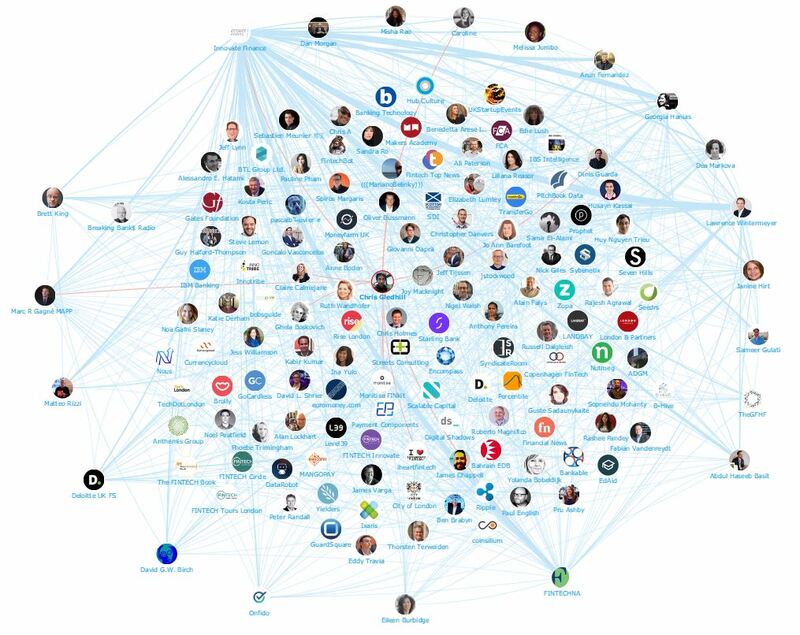 We looked at all the individuals engaging on Twitter to bring you a list of the top influencers at #IFGS17. Below is the top 50, if you want to see who ranks from 50-100 be sure to download the full report by clicking the download button below. 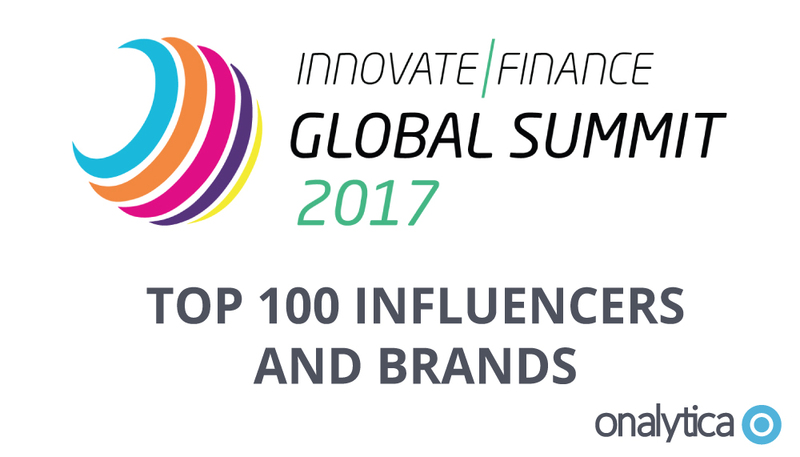 We also looked at all the brands engaging on Twitter to bring you a list of the top brands talking about Innovate Finance Global summit 2017. Below is the top 50, if you want to see who ranks from 50-100 be sure to download the report to get the full top 100 list, and see who are most the influential brands in #IFGS2017. Disclaimer: As ever with these lists, it must be stressed that the ranking is by no means a definitive measurement of influence, as there is no such thing. The brands and individuals listed are undoubtedly influential when it comes to driving discussion at #IFGS17.